Breast Pump Market size is set to exceed USD 1.6 billion by 2024; according to a new research report by Global Market Insights. Increasing breastfeeding rates and rising demand for breast pump will boost market growth. Growing women employment rate along with escalating population are factors driving breast pump market growth. As per United Nations Department of Economic & Social Affairs, 2017 data, the world population of 7.6 billion is projected to reach around 8.6 billion in 2030, 9.8 billion in 2050 and 11.2 billion in 2100. With nearly 83 million individuals being added to the world’s population every year, the rising trend in population size is anticipated to continue. Thus, such aspects are estimated to drive business growth over the coming years. Issues concerning with contamination of milk and excessive cost of breast pump are factors hindering market growth. Moreover, some pumps are designed to be used in microwave and are slightly costly than regular products thereby, hinders business growth. Demand for closed system is increasing due to wide-ranging advantages that are offered by closed breast pump system. Closed system is attributed to grow at a CAGR of 8.4% during 2018 to 2024. Moreover, the trend of opting closed system rather that open system is rendering positive impact on the closed system segment. 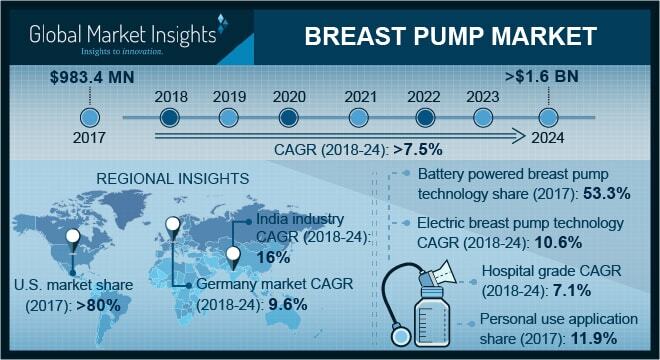 Escalating demand for battery powered breast pumps coupled with availability of advanced pumps are factors driving battery powered segment market growth. The battery powered segment is estimated to grow at a CAGR of 6.5% during forecast period. Advances in technology has provided efficient products as well as enhanced pumps with easy to handle pumping functions. Such factors boost battery powered breast pump industry growth. Electric breast pump segment held 30.9% market share in 2017, on an account of numerous benefits offered by electric pumping coupled with technologically advanced features equipped in electric pumps. Hospital grade segment accounted for 866.2 USD million in 2017, owing to increasing demand for hospital grade and associated benefits that include quick pumping, with hygiene and safety. Personal use segment is estimated to grow at a CAGR of 11.8% over the forecast timeline owing to prolonged usage that is offered by personal use breast pump and advances that reduces adulteration and provides proper sterilization. UK accounted for 20.4% market share in 2017. UK breast pump market will witness robust growth over the forecast timeline. Growth is attributable to growing use of hospital grade breast pumps in UK coupled with increasing employment rate for women in the country. India is projected to grow at a CAGR of 15.9% during 2018 to 2024, owing to factors such as, improving healthcare infrastructure, coupled with increasing population and availability of advanced breast pumps in the country. Some of the prominent business competitors in global breast pump market are Acewin, Albert, Ameda, Ardo, Babybelle, Bailey Medical, Beldico, Buettner-Frank, Hygeia Health, Lansinoh Laboratories, Linco Baby Merchandise Work's, Medela, NUK, Philips, Pigeon, and Spectra Baby Products. The business competitors focus on new product launch with enhanced features and capability to pump efficiently. For instance, in May 2016, Lansinoh Laboratories, launched Bluetooth enabled breast pump that is easy to use. Additionally, the smart pump syncs with baby app that can track bottle-feeding and breastfeeding sessions, baby’s growth and diaper changes thus providing enhanced care of baby. Such aspects encourage customer buying behavior.